Following his stellar sophomore campaign, Deron had the option to enter the NBA Draft, but he chose instead to continue his career and education at Illinois. Big things were expected of the Illini after a strong finish to their 2003-2004 campaign and Deron, selected as the Preseason Big Ten Player of the Year, was not about to let them disappoint. From the outset of the season, Illinois looked and played like a team of destiny. They won two of their first three games by 31 points and the other by 20. Next came a tough stretch of non-conference games, but they were unfazed. D-Will scored 20 points to lead them to a 17-point win over Gonzaga, then passed out 11 assists to win the head-to-head match up with Chris Paul in a 18-point Illini victory over No. 1 Wake Forest. After a dominant win over Arkansas on November 4th, Illinois rose to the top spot in the AP poll for the first time since 1989 and only the third time in school history. Illinois finished non-conference play a perfect 14-0, including dominant wins over Georgetown (74-59), Oregon (83-66) and Cincinnati (84-65) and entered conference play unbeaten for the first time. Through those 14 games, D-Will was as good as he’d ever been in his college career. He posted double-digit points in 11 of the 14 games and averaged 14.6 points and 6.5 assists per game. 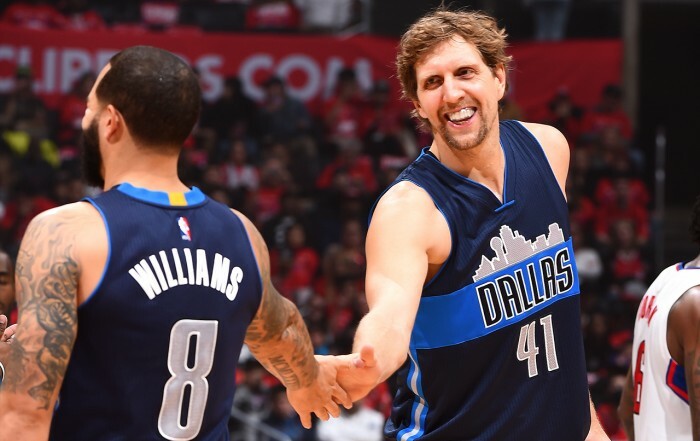 As conference play began, Deron kept up the high-octane pace despite loging even more minutes. In the conference opener against Ohio State, he played 39 of the 40 game minutes and dropped 14 points and eight assists in a 84-65 Illinois win. In the previous two years, Illinois generally hit a two-game speed bump at some point during conference play, but in 2004-2005, it never happened. They just kept winning and doing so with style points. Of their first nine Big Ten games, Illinois won seven by double-digits. D-Will was routinely putting up 10 points a night while hanging near the top of the nation in assists. The Illini met their first big test of the young season on February 8th in Ann Arbor, Michigan. 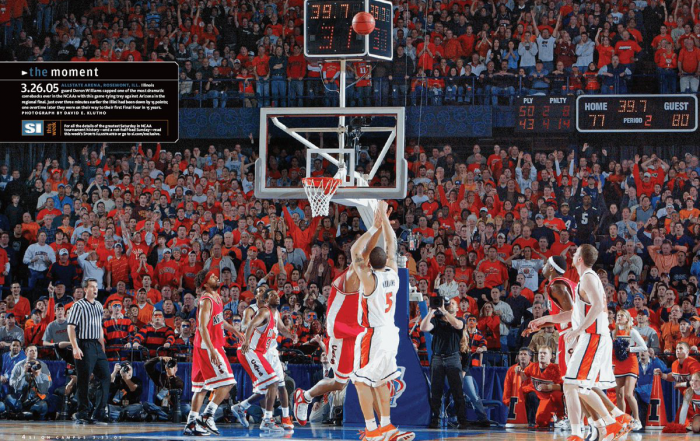 The test would force Deron to play the entire game to help Illinois escape with a 57-51 win. Just a few days later, they rolled to a 70-59 win over No. 20 Wisconsin, their 25th victory of the season. They rolled to double-digit wins in their next four games, setting up a Big Ten regular season finale at Ohio State with a chance to finish the regular season undefeated for just the second time in school history and 10th time in Big Ten history. But it wasn’t to be as Ohio State ended the prefect season dream with a late three and a 65-64 win. Still Illinois easily wrapped up the outright Big Ten title for the second time in D-Will’s three years and once again clinched the top-seed in the Big 10 tournament. Deron finished conference play averaging 6.7 assists and 10.6 points per game. The Illini opened the Big Ten Tournament with a quarterfinal drubbing of Northwestern, 68-51 behind eight points and eight assists from D-Will. 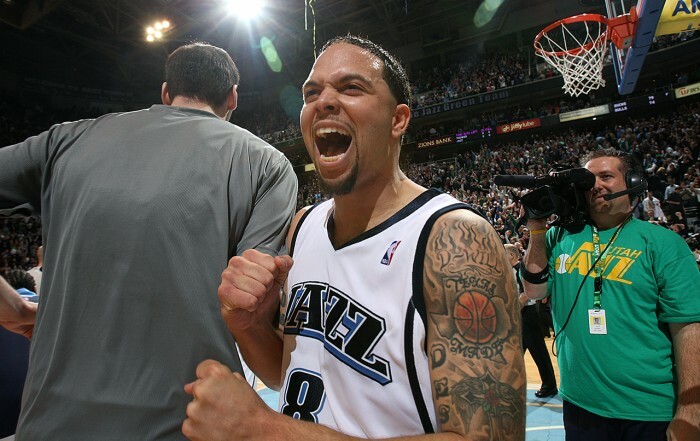 Then they disposed of Minnesota 64-56 with the help of 12 points and five dimes from Deron. Finally it was on to the final, where they Wisconsin for the second straight year and evened the score with a 54-43 win to clinch the Big Ten tournament title. The Big Ten Tournament run clinched a No. 1 seed for Illinois, who entered the tournament with a target on their backs and would face a challenge at every turn once the NCAA’s got underway. In the opening round, they survived a stiff test from Fairleigh Dickinson as Deron finished with eight points and six assists in the 67-55. Things didn’t get much easier in the next round as Nevada pushed Illinois to the limit, but D-Will his second double-double of the season with 15 points and 10 assists to secure another 12-point victory. The win propelled Illinois into the Sweet 16 for the second straight year, but their story was far from over. They put an end to Cinderella’s run in the Sweet 16, knocking out 12th seeded Wisconsin-Milwaukee 77-63 behind 21 points and eight assists from D-Will. The Illini called on D-Will again in the Elite Eight against Arizona and he delivered as only he could. Illinois trailed by 15 with four minutes left in the game, but staged a torrid 20-5 run, capped by a trey from Deron to tie the game at 80. That forced overtime where No. 5 took over. He hit two more treys in overtime to push the Illini up by four and his defense helped them hold off one last push from Arizona to secure the victory. The win sent Illinois to St. Louis for the Final Four where they would face off with Louisville. In the penultimate game of the college season, D-Will handed out nine assists and played lock down defense on Louisville’s as Illinois cruised into the National Championship Game with a 72-57. In the title game, Deron and the Illini were faced with one of the toughest teams in college basketball, the University of North Carolina. 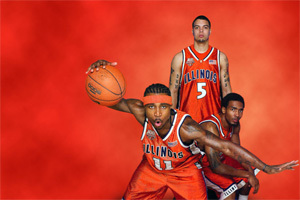 The teams had played twice in D-Will tenure at Illinois, splitting a home-and-home, but never with these kind of stakes. The game was a back and forth battle and the Illini fought hard to the end. With the national spotlight upon him, D-Will excelled. He finished second on the team in scoring, tied for first in assists and matched Carolina’s Raymond Felton play-for-play. But it was Felton and UNC who would raise the trophy. Still Illini coach Bruce Weber was proud of what his team had accomplished. 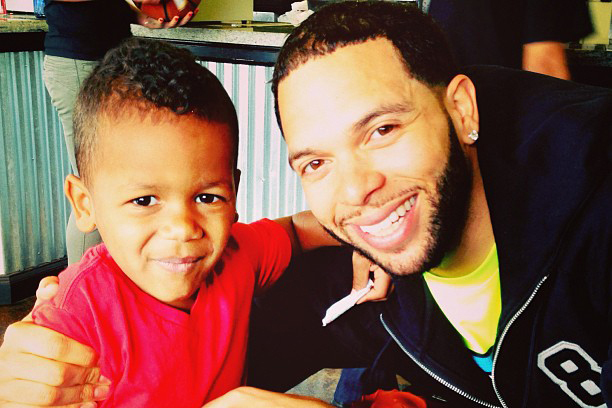 For Deron, the game would be his last in college. He finished the NCAA Tournament with an average of 12.6 points and 7.1 assists per game, a slight uptick over his full season numbers of 12.5 and 6.8 respectively. He was named to the All-Tournament team in addition to receiving the Most Outstanding Player award for the Chicago Regional. 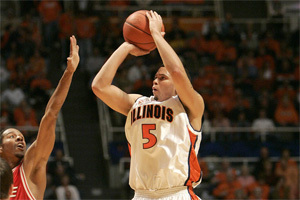 D-Will ended his Illini career 2nd on the school’s All-Time assist list with 594 and in the top 40 in points with 1,111. He still holds the Illinois single season record for assists with 264 in his final season and also ranks eighth in school history in three-pointers made with 163. He helped push the team to two outright Big Ten titles, two Big Ten Tournament titles, three NCAA tournaments and a National Championship game. He entered the 2005 NBA Draft and was selected with the No. 3 pick by the Utah Jazz, the highest an Illinois player has ever gone in the draft. 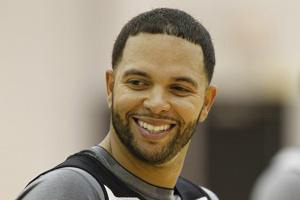 Now Deron represents Illinois in his career through his work on the court as one of the NBA’s elite point guards a two-time NBA All-Star and Olympic Champion. But he also embodies Illinois through his work off the court with his Point of Hope Foundation, which puts on several charity events a year in an effort to help young children and their families. He returns to Champaign every summer to put on the Deron Williams Illini Hoop Legends Charity Event and participate in alumni basketball games. 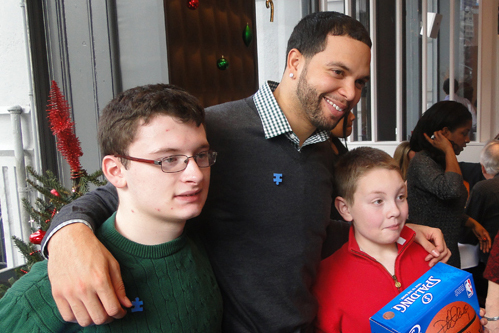 Illinois is and always will be a big part of what makes Deron who he is.